Arduino and Makey Makey in MOMA! #ArtTuesday « Adafruit Industries – Makers, hackers, artists, designers and engineers! When thinking about the masterpieces in MoMA’s collection, one might be forgiven for visualizing Picasso’s Demoiselles (1907) or Jackson Pollock’s One (1950). The canon of visual art and design—a force that has shaped popular opinion—has, for centuries, held large-scale painting in high regard. Even the Oxford Dictionary entry for “masterpiece”—(noun): A work of outstanding artistry, skill, or workmanship”—uses Picasso as its defining example. We’re not arguing with the Oxford Dictionary—we still get wonderful chills in front of such works—but masterpieces come in all shapes, sizes, and mediums, taking form for hundreds of different reasons. Indeed, in 2004 we organized a show called Humble Masterpieces, in which we proudly displayed some pièces de résistance in MoMA’s design collection—the Post-it Note, for instance, or Chupa Chups and the Bic Cristal pen, to name just a few—acquired over the decades by several curators. So we’re very happy to announce that this fall we have brought five new humble masterpieces into the fold. We’re delighted to introduce Arduino, Ototo, Makey Makey, the Colour Chaser, and the DIY Gamer Kit, all soon to be on display in the design galleries in the new year. While all five might be small in scale, their significance for contemporary design—and the world at large—knows little bounds. Like Botanicalls and Little Bits, which we acquired in 2011, these objects reflect the deep and central role technology and interface design now play in education, production, and our everyday lives. In their own unique ways they allow audiences—artists, designers, and active maker-culture enthusiasts, pros, children, and amateurs—to engage with the processes and final products that are usually the preserve of electronic engineers. A tiny but powerful microcontroller, the Arduino is an open-source, programmable microchip housed on a circuit board that fits in the palm of one’s hand—an apt metaphor for the control over design functions that it allows its user—and a pillar of contemporary maker culture and practice. Designed by a star-studded team, the Arduino can be programmed to drive components such as sensors, LEDs, and motors in order to build and develop all kinds of interactive objects. This new building block of design has resulted in applications as diverse as light sculptures, digital pollution detectors, and tools to help people who are unable to use such common interfaces as a computer mouse. 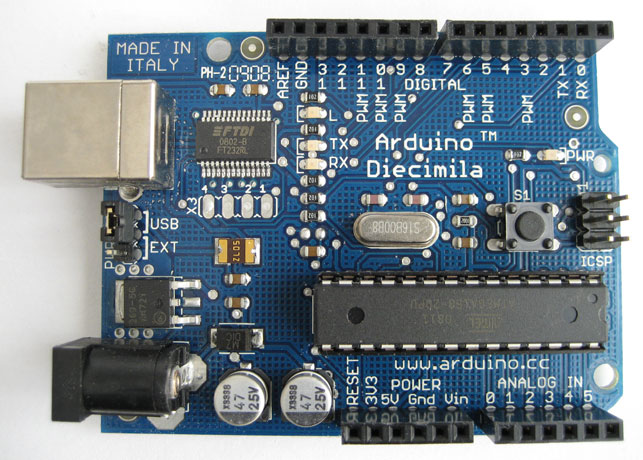 Beyond its concrete applications, the Arduino acts as a platform for the interdisciplinary practice that lies at the heart of so much compelling contemporary work across science and the humanities.